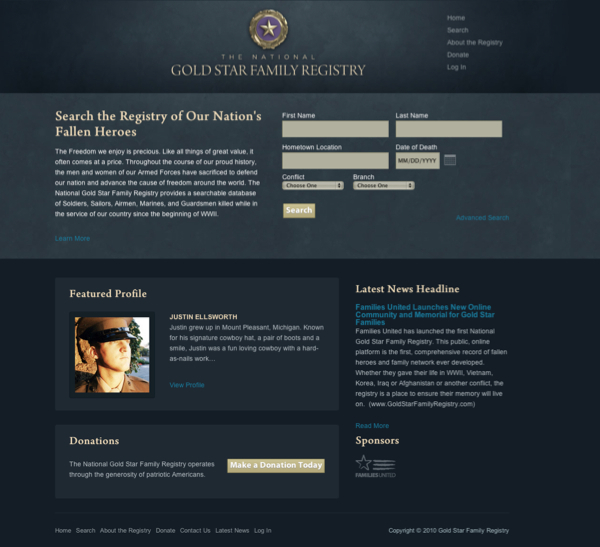 Web Development Groups technical staff successfully deployed a new web infrastructure for The National Gold Star Family Registry utilizing Ruby on Rails framework. The National Gold Star Family Registry is a 21st Century Memorial that utilizes the latest in technology to provide a searchable, scalable database of America’s fallen Heroes since WWII. The Registry is accessible to all Americans from homes, classrooms, libraries, or anywhere with Internet access. The technical infrastructure permits the public to search the Registry using a variety of criteria. Family members, friends and comrades can tell the story of their hero by adding written tributes, which the Registry will preserve for future generations. Like never before, American’s will be able to get a sense of who these brave men and women were, the cause for which they died, and—most importantly—how they lived. The Registry is accessible to all Americans from homes, classrooms, libraries, or anywhere with Internet access. The technical infrastructure permits the public to search the Registry using a variety of criteria. Family members, friends and comrades can tell the story of their hero by adding written tributes, which the Registry will preserve for future generations. This is an amazing opportunity and being able to provide such information online is a great accomplishment for the organization said Ab Emam founder of WDG. We are proud and absolutely thrilled to be part of such a cause and accomplishment.